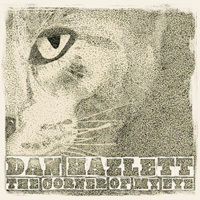 Dan Hazlett: "The Corner of My Eye"
Okay, here we go. To begin to make an attempt at putting Dan Hazlett’s musical body of work in a box would be an act of musical treason. His work in studio whether it be behind the boards, in the vocal booth, or playing guitar, he truly has the ear and brain for this music thing. This album marks Hazlett’s ninth studio release, a truly remarkable accomplishment and a testament to this extremely talented and well-rounded individual’s accomplishments.